Porsche has revamped the 911 Carrera, adding twin-turbocharging to improve performance and efficiency. The latest generation features new headlights, 20 hp more from the flat-six engines and a new chassis for a better balance between performance and comfort. Exterior styling tweaks include the new headlights now with four-point daytime running lights, new handles inset to the door panel without recess covers, a redesigned engine lid with vertical louvres and new tail lights - including a four-point brake light Porsche motif. 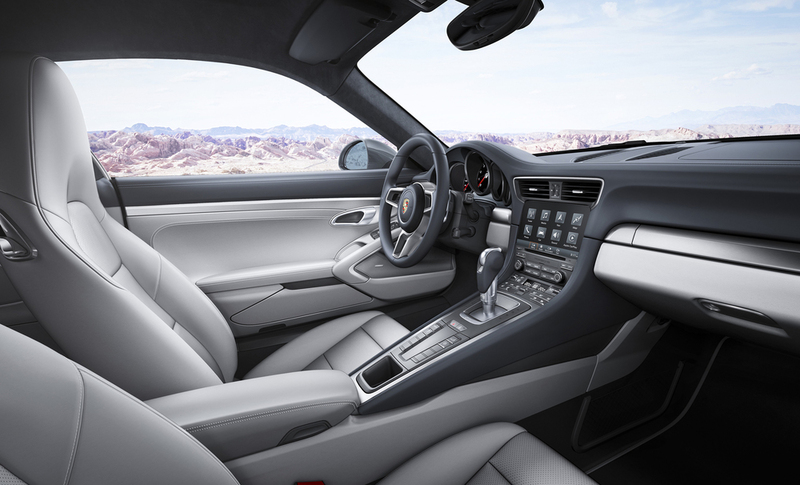 On the inside, a new Porsche Communication Management with an enhanced multi-touch display console offers an expanded range of functions and simplified operation. The completely new engine generation with twin turbocharging now featured in the 911 Carrera has raised power and efficiency. At the rear of the Carrera lies a 3.0-litre flat-six engine, developing 370 hp (272 kW). 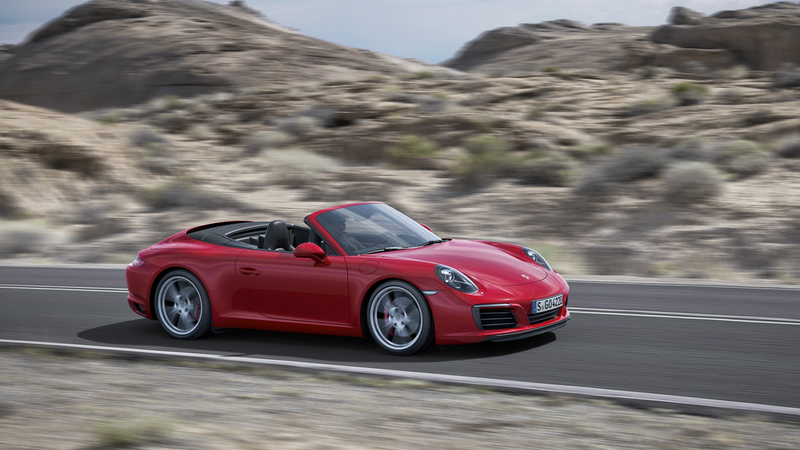 The 3.0-litre flat-six in the Carrera S now delivers 420 hp (309 kW). In both cases this represents a power boost of 20 hp (15 kW) over the previous model. The 911 Carrera S produces more horsepower courtesy of turbochargers with modified turbine compressors, a specific exhaust system and tuned engine management. The 911 Carrera Coupe with Porsche-Doppelkupplung (PDK) and Sport Chrono Package sprints from 0 to 62 mph in 4.2 seconds - making it two tenths of a second faster than its predecessor. The 911 Carrera S with PDK and Sport Chrono Package achieves this benchmark in just 3.9 seconds (also 0.2 secs quicker). This means that it is the first 911 in the Carrera family to undercut the four second mark. The Carrera now has a top speed of 183 mph (an increase of 4 mph), while the Carrera S now reaches 191 mph (an increase of 3 mph). A new option of rear-axle steering is also available on the Carrera S models for the first time. Depending on the model, the car is now almost 12 per cent more efficient. The Carrera with PDK transmission returns 38.2 mpg Combined (an increase of 3.8 mpg), while the Carrera S with PDK consumes 36.7 mpg Combined (an increase of 4.2 mpg). In conjunction with the optional Sport Chrono Package, the refreshed model now features a 'mode switch' on the steering wheel, derived from the hybrid mode switch of the 918 Spyder. The mode switch consists of a rotary control with four positions for the driving settings "Normal", "Sport", "Sport Plus" and "Individual". Depending on the car's specification, the latter setting enables drivers to configure their own individual vehicle set-up; eg Porsche Active Suspension Management (PASM), PDK transmission shifting strategy and sports exhaust system. In combination with the PDK, the mode switch has an additional "Sport Response Button". When this is pressed, the drivetrain is pre-conditioned for maximum acceleration for 20 seconds, in anticipation of an overtaking manoeuvre, for example. For a short time, the optimum gear is engaged and the engine management adjusted to an even more spontaneous response. The new PASM (Porsche Active Suspension Management) chassis, which lowers the ride height by ten millimetres, is a standard feature of every Carrera model for the first time. It further improves stability during fast cornering, while new dampers enhance comfort thanks to an even more precise response characteristic as well as improving body control during dynamic driving. The new wheel designs with five slim twin spokes carry tyres with reduced rolling resistance and enhanced performance. Furthermore, on all variants the width of the rear rims has increased by 0.5 to 11.5 inches. With everyday practicality in mind, a hydraulic lift system with integrated lifting cylinders in the struts of the front axle can be specified. Pressing a button increases the ground clearance at the nose by 40 millimetres within five seconds and thus prevents the vehicle underbody from hitting the ground, when traversing steep garage exits for example. The new Porsche 911 Carrera models are on sale now, with on-the-road prices starting at £76,412 for the 911 Carrera Coupe, £85,857 for the 911 Carrera S Coupe, £85,253 for the 911 Carrera Cabriolet and 911 £94,698 for the Carrera S Cabriolet. First customer deliveries are expected in December.